Time for another wizard jam! What I want to do this time is create a sort of puzzle game where the puzzle is the Brain Burglar's mask. You'll basically be pulling and prodding different parts of the face to reveal new parts and interactions and finally find the zipper to tear off the mask and move on to the next disguise. It is sort of inspired by the interrogations in the Ace Attorney game series and the game GNOG (though I am basing that on just the trailer, since I haven't yet had a chance to play it). I included limited facial animations with separate features in some of my previous games and I hope I can go a lot further with that here. So far I have ideas for four different phases/faces and at least three should hopefully make it in, with more if time allows. 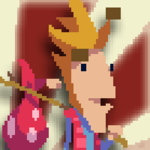 I will be reusing and extending the dialogue system I made for my wizard jam 6 game, The Rooster's Stupid Secret. 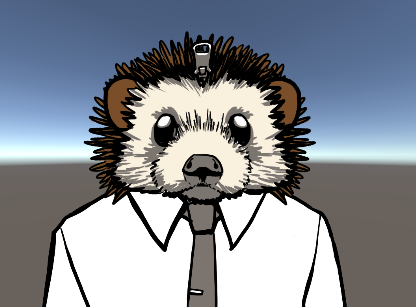 I am also planning to reuse some of the detective characters from that game so I can quickly set up the premise, so it will be sort of a sequel. I hope to have the first two faces with all interactions and script more or less done by next weekend. Here is a gif of the first face I'm working on. The interactions are pretty basic right now, but hopefully I'll be able to include some real puzzles in later faces. 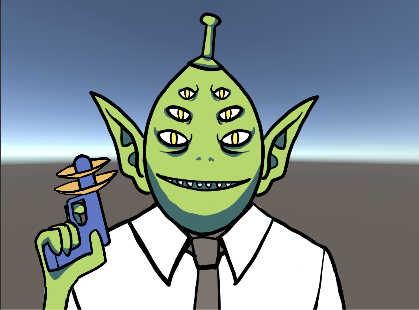 I am using Unity again. It would probably work in 2D, but I am working in 3D with an orthographic camera since that's what I am used to. Cool concept and the art is looking real nice. I like how the eyes follow the mouse! Really neat idea and the gameplay seems nice and "tactile"! Progress has been a bit slow. I think I underestimated how much work it would be to get all the animations and interactions in. I have finished the first head and added two more, but not all the interactions are there yet. I hope I can finish those this weekend, and then I'll have next week to make the last face and get all the menus and other odds and ends in there. The dialogues are now editable and reorderable in the unity editor, which makes them a bit easier to manage. In my previous game I had them all in separate script files. I did this with this script by t0chas: https://gist.github.com/t0chas/34afd1e4c9bc28649311 Maybe someone else will also find this useful. Overall I am pretty happy with it. In retrospect I do think it was a mistake to use the dialogue subsystem and characters from a previous jam entry. It just didn't feel as fresh while I was working on it. I would've liked to get one more disguise in, but I just didn't have the time. The puzzles also ended up being simpler than I would've liked, but I hope everything around it will still make it enjoyable. 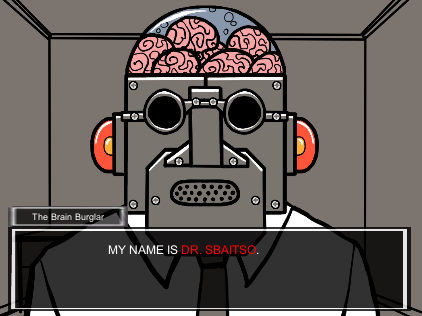 I think DR. SBAITSO was mentioned in a couple of idle thumbs episodes, though I can't recall exactly which. I liked the robot voice and thought it would make for a neat 'true identity'. Some of the lines in his opening dialogue are also copied from the old DR. SBAITSO application. You can also alter the voice parameters by entering ".param" and then entering a 4-digit code, but I didn't really experiment with that. I haven't been very active in keeping track and commenting on other people's projects, but I look forward to making up for that in the coming week and during the showcase weekend. I really love the art style and the animations and characters are great. The zipper transition animation and unscrewing the screws from dr. sbaitso's face were my favourite bits. The characters as animals were also great. Ahh! I enjoyed this a heck of a lot. I remember playing one of your previous games and enjoying that too, so it was nice to vaguely remember the characters. Once again, great writing and excellent art style! The gameplay is satisfying too. I love the (by now)series of Inspector Fetchem games! The art is just brilliant and perfectly fits with the writing and simple but fun gameplay.